As a result of a long-term strategy set forth in 2000, Maktime Watch Factory has gone on to become one of the top three watchmakers in the Russian watch industry in 2007. In 2003 Maktime purchased a controlling share of one of USSR’s leading watch makers – the Penza 3rd watch factory (founded in 1940). The factory’s history is steeped in tradition. It manufactured wrist watches under the famous brands of Zvezda, Pobeda, Zaria, Mechta, Unost and Vesna as well creating and putting into production movement calibers (1509, 1609, 1800, 2009 and 2615). Almost everything that was built there was made available for export. In 2005 Maktime acquired the 1st Moscow watch factory ‘Poljot’ production line which manufactured chrono movement 3133. ‘Poljot’ staff who worked on this production line were subsequently employed by Maktime. At the present time, batch production of the chrono movement 31 calibre is fully set up. 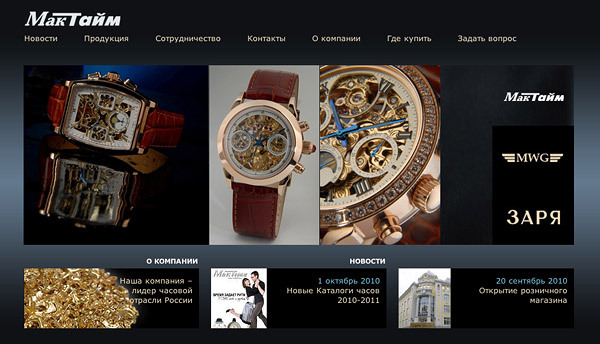 In 2006 Maktime acquired a stake in the 2nd Moscow watch factory ‘Slava Moscow’. This move allowed Maktime to substantially increase the quality and volume of production. Today, ‘Maktime’ is a full circle watch factory. Movements with 31 calibre – is a unique chronograph in Russia . It is presented by movements line on the base of 3133 with 23 ruby jewels. Height: 7.38 mm, side second hand, anker move, balance anti-shock device, date calendar, summing-up stopwatch, side minute counter. Its modifications have additional functions: 31679 – lunar calendar, 31681 –24-hour dial, 31682 – day-night indicator and 24-hour scale, 31677 – day of the week calendar. 31-calibres movements is used during manufacture by “Maktime” chrono- watches in cases made of 14 ct gold, stainless steel, titanium. ‘Maktime’ movements are used by watch companies: Volmax, Poljot, Tsedro, Denissov and Record. These movements are used in the watches: Aviator, Buran, Poljot, President, Denissov and Record. Some parts of the movements are exported to Germany and Switzerland. Movements 1509B.1, 2009B , 2014A (15 and 20 calibres) – central second hand , balance anti-shock device, date calendar (for 2014A ). Since April 2007 ‘Maktime’ has been producing a limited line of exclusive watches and watches for individual order. Watches with precious metal cases and with movements 3133, 3105 and 2009. Most parts of the exclusive products are skeleton watches with customisable cases and movements that can be decorated with precious stones. Movements and dials can be made in different execution and their surface has inimitable patterns. ‘Maktime’ is also able to produce watches with gold leaf designs via a traditional method of handcraft. Gold leaf is used for gilding different surfaces, decorative elements of metal, wood and other materials for gilding domes, arches, frames, settings and plastered surfaces. Gold leaf is widely used in restoration projects, furniture manufacture and typography. I am looking for a Clockwork “VESNA88155 (189) ” repair Script. I have this watch since 3 Years as a gift from a Russian Guest. The Clock does not work. Maybe it is possible to get a Picture how the watch is built. Thanks a lot for your time and an Answer will be very helpful to repair this watch.